For much of the 20th Century rock fans had their musical fix delivered over the airwaves into their car radios, the transistors they held in one hand while walking down the street or the boomboxes they hefted on their shoulder while walking back down that same street twenty years later. Like most… some?… of you, those of us who have come of age in recent times I don’t know anybody who actually listens to the radio. I’m sure there are some who must, otherwise it wouldn’t still exist, but I’m inclined to think it must be just old people who apparently do so out of habit, or at least a lack of awareness of the alternatives. But once upon a time the radio was an omnipresent fixture in the lives of teenagers and twenty-somethings who elevated rock music to undreamed of heights. Though radio’s role in spreading rock was still somewhat limited in the late 1940’s and all but extinct by the 1990’s, for the bulk of its first fifty years rock ‘n’ roll owed a good deal of its popularity to the faceless dee-jays whose voices floated in the ether. Since part of the story of rock ‘n’ roll music that we’re attempting to chronicle here revolves around the means of dispersal in getting the music to awaiting ears, it’s only fitting that we actually meet a few of these shadowy figures from time to time on Spontaneous Lunacy. We’ve already been introduced to a few – Al Benson, Jackson Lowe, Vernon “Dr. Daddy-O” Winslow, along with non-rock announcer Spider Burke and even radio show sponsor Maxie Waxie Silverman – over the past few months, but all of those, as important as they were, came about because of a rather Faustian bargain record labels made with them by affixing a title championing a prominent disc jockey to an instrumental record in the hopes of currying favor with them for pushing their product over the air. So here it’s nice to be able to focus on something that had nothing in the way of underhanded quid pro quo connotations but rather merely circumstantial connections made organically between the music, the dee-jays and the audiences who listened to the latter bringing them the former, day after day, night after night, as they all grew along with it. Rock ‘n’ roll, as we’ve detailed in quite some depth (since that’s our job here), was born in the latter half of 1947. A year later, almost to the day, was born the career of one the first radio dee jays who would become synonymous with rock music to a large section of America. 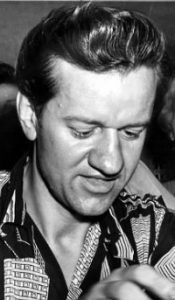 Porky Chedwick was already thirty years old when he got his start on radio spinning records in Pittsburgh, Pennsylvania. Having had some experience as a high school sports announcer following his graduation Chedwick answered an ad in the paper in the summer of 1948 when WHOD (later changed to WAMO) was going on the air August 1st. He was assigned a ten minute sports show which included some music and quickly the music began to take over. Chedwick, despite being white, was tuned into rock ‘n’ roll from the very start and it being radio nobody was quite sure who he was, what he looked like, or what his background was. That was always one of radio’s most alluring features, the mystery of it all. For the next forty years Chedwick was Pittsburgh’s Daddio Of The Raddio… playing (primarily black) rock ‘n’ roll to anyone inclined to listen, which increasingly included everybody under thirty, regardless of race or gender. This music was supposed to be just a temporary fascination of course and the widespread belief was that once you came of age and matured your tastes would mature along with it and you’d leave this unholy racket behind forever. But for those around Pittsburgh who’d made his radio show one of the most popular in the city despite it being on a station that barely had enough wattage to light up a streetlamp, there was no need to grow up, not when The Bossman, as he was also known, kept playing Dusty Discs, his term for bygone records that had long since left regular rotation elsewhere. As a result rock ‘n’ roll, with the help of guys like Porky Chedwick, became a lifelong pursuit for many wayward, but ultimately happy, souls. What does all of this have to do with this particular record? Well, it just so happens that his theme song for much of this time was an otherwise obscure record released not long after he got his start on the air, credited to the female pianist in Johnny Otis’s band, Deviona “Lady Dee” Williams, a tall, thin, elegant woman with some killer chops on the keys. Thus, maybe only for those who listened faithfully to Chedwick’s show over the years, Bongo Blues had a much longer afterlife than records that were #1 hits for months. 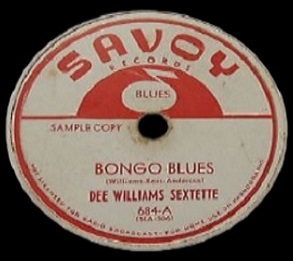 Kicking off with an intoxicating drum pattern and a whistling in the dark refrain that sounds somehow menacing in a way despite its cheery melody, the song is a prime example of the type of interlocking groove that Johnny Otis’s bunch had featured so prominently on Joe Swift’s breakthrough (That’s Your Last Boogie) the previous fall. Except for one thing. Otis and company were actually nowhere to be found on this. Instead Williams was backed by a motley crew of names, only one of which, trumpeter John Anderson, had graced any of the Otis led sides. But fear not, it doesn’t suffer in the least for the substitution for despite the lack of an historical rep to equal Johnny’s crew (in rock ‘n’ roll at least, most of these cats were highly skilled jazz sidemen) these guys prove themselves just as capable, laying down an invigoratingly repetitive riff anchored by Williams darting piano work. It’s mood music for reform school dropouts, at once both spry and upbeat and strangely sinister. Maybe it’s the whistling but it calls to mind the similar juxtaposition of the child molester/murderer Peter Lorre played in the classic film M, something that on its surface was perfectly innocuous but which in the right context brought chills. The key for most instrumentals in their effort to connect has always been finding an instantly identifiable hook to capture listeners ears. This was all the more vital to secure radio airplay where failure to do so resulted in listeners impatiently switching the station, unsure of what they were hearing and too impatient to wait the fifteen or twenty seconds to find out, which is but one reason why instrumentals fell out of favor as the years went by. But those songs which replied on a more hypnotic overall feel, like Bongo Blues, needn’t worry about ever losing a listener. More than most songs with vocals, a great instrumental doesn’t wear thin over too many listens, maybe because it seems to offer you considerably more than appears on the surface, provided you can somehow unlock the door to find your way inside to learn what those secrets may be. That you never quite get in that door and get to find out what’s behind the curtain so to speak is part of the allure of these records. They’re tantalizing in a way that never approaches frustration, even as they always fall short of delivering on their promise of revealing the mysteries they possess. You never get tired of trying. 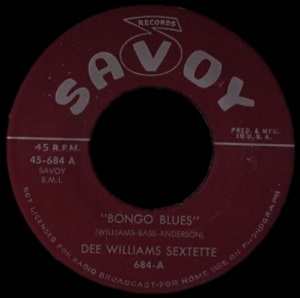 Bongo Blues is hardly the most obvious candidate to become a hit. For all of its stellar playing there’s no moment that is designed as the focal point, even the somewhat wailing sax solo comes across as just part of the texture when the trumpet line and drums are buttressing it on either side, and so there’s nothing specific designed send the audience into a frenzy and send the record onto the charts. The records which do contain the requisite attention grabbing hook may wind up capturing people’s fancy immediately, but may not keep their grip on them for nearly so long. In those cases the performance at the center is what you come for and once fully absorbed, over one spin or a couple dozen, you’ve squeezed all you can out of it and are content to move on to something else. The more elusive songs like Bongo Blues surely don’t grab as MANY listeners ears right away, but those it does capture wind up getting an earworm that will stay with them far longer, pulling them back to the source, its thousandth spin just as bedeviling as its first. Though I never heard Porky Chedwick other than a handful of air-checks in the years since he passed away at 96 in 2014, I imagine he had the same effect on his listeners as this song did. While his rhyming shtick and somewhat odd tone may sound slightly ridiculous in the sterile confines of modern analytical searches, those same attributes have an otherworldly quality to them when spoken directly TO you as a kid who’s yet to come of age and be taken seriously by anybody, whose tastes in music is widely derided by adults and who are seen by many as yet unformed prototypes of a still to be determined final product… still waiting for the mold to harden and see what you’ll make of yourself when you finally grow up. But as anyone who’s ever been in that position knows full well, the experiences, the interests and the outlooks you have during those years are every bit as relevant, every bit as important to who you’ll eventually become as all of the lessons parents, schools and culture tries drilling into you. The music you gravitate to at 14 years old will in many ways still define you at 40 years old. For those around Pittsburgh over the years Porky Chedwick was the one who first exposed them to something which would play an important role in their lives… to validate your own culture in some small way to the white world if you were black, and to open your eyes to the richness of the black world if you were white. Those are lessons every bit as important in the big scheme of things as who signed the Magna Carta, the principles of long division or the price of the Louisiana Purchase. Far greater in fact, provided those listeners took the underlying messages inherent in the songs played by this half blind, big nosed guy named Porky to heart. There were guys like Chedwick in most American cities after the war, some only briefly popular, others seemingly popular for eternity. They held a decidedly unglamorous job that through the power of their own ability to put you under a trance could be made to seem glamorous. If not Chedwick, if not Pittsburgh, this story could be about any one of them and for those who came of listening to those faceless voices floating through the air it would be a story that resonated thanks to their own personal memories. But the one thing that would be different is this – Bongo Blues wouldn’t be the review this essay was attached to. That record belonged to Porky Chedwick and his listeners and for Devonia Williams, who otherwise might be all but forgotten except for a few historically minded lunatics like us, the fact that this song lives on in some small way, at least for those who came of age listening to the radio in one region thanks to Chedwick, is reason enough to call his career decision a wise one. 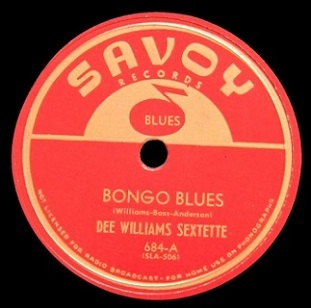 Leave a reply on "Dee Williams: “Bongo Blues”"